Crafting has typically been used as a purely functional medium or a an aesthetically decorative form of art. Recently there has been a resurgence of a type of Arts and Crafts movement that shows that knitting and crocheting are not just for little old ladies anymore but have their own place in contemporary fine art. Many would argue that there is a fine line between what makes traditional art forms and what makes a traditional crafting form. There are many similar processes that seem to overlap between the two. Some processes that I believe to be (formerly) purely craft forms would be that mediums of crocheting, knitting,and tatting lace. There was a movement in the past very similar to the movement we are seeing now with crafts called "The Arts and Crafts Movement" only this movement moved crafts from a utilitarian form to a design and decorative form. One artist that is starting to blur the lines between pure craft and fine art is Lisa Anne Auerbach. 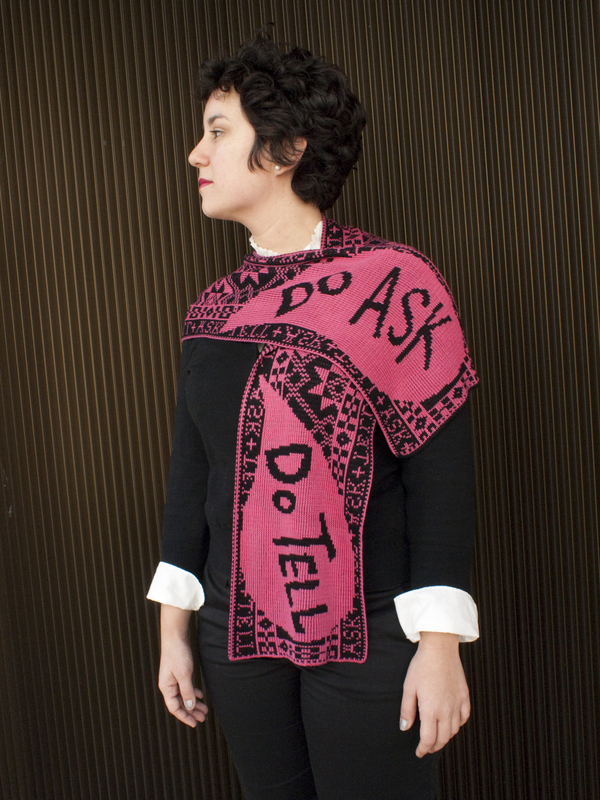 She uses knitting as an art form to convey political and social commentary. She uses these mediums in the context of fine art in galleries and exhibitions and she also uses in a commercial sense as well. 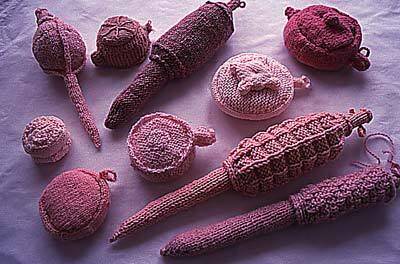 A viewer can actually buy some of her knit work through her blog. When seeing some of Auerbach's work there is a permanence with her knitted art that is not quite as acknowledged with some other mediums. They are able to come into the real world and be tangible and durable, so durable that in fact you can buy one of your very own, wear the art. The traits of her knitting that I also notice is that it is extremely professional, a viewer can look at her art and know that it mean't to be art but there is also an accessibility and "fun-ness" to the medium that seems to make it open to many more people. The viewer may look at the scarf above and feel more open to what she is protesting (or in this case, celebrating) because the medium is more familiar to them. Dave Cole is another artist who uses a crafting medium in contemporary art. He is a sculptor and knitter and definitely takes a different approach Auerbach. There is still a whimsical element to his art (much like Auerbach) but there is a much less commercial aspect to his work. You cannot order this 16 foot teddy bear on his website. This probably has to do with the fact that a theme of his art is commentary on american patriotism, industry and domestic life with work. One sculpture in particular that shows his commentary on industry and american patriotism is called Knitting Machine, 2008. This sculpture also quite blatantly shows his influence of crafting processes. Cole uses a familiar technique, knitting, with very unusual materials. For example the picture shown above is of a knitted teddy bear but Cole uses fiberglass insulation and urethane fixative to knit this piece. 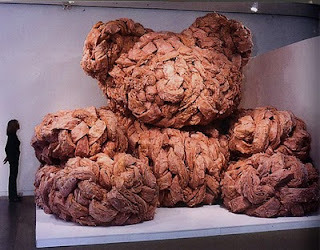 The whimsical nature is shown through the fact that it is a teddy bear and it has been knitted but he puts a new spin on it by using a new material. Some may take it as a dangerous material and there for almost obliterates the inherent "cute-ness" of the subject matter and makes it almost sinister. I believe the inherent war between material and method is a great concept from this artist. I believe the method he uses, a craft method, still makes this piece accessible to many people. It invites the viewer in and almost tricks them once the viewer realizes that it is not just a giant adorable teddy bear but indeed made of fiberglass. My final observations on crafting making its way into the fine arts realm is that it is a very effective method to convey aesthetic and opinion information to the viewer. Crafting mediums have been so long associated with grandmothers and rocking chairs, an artist can use them in a way to express something possibly controversial and not necessarily "scaring" the audience away. Rather inviting a conversation between artist and audience. I think you did a great job of explaining the ways in which arts and crafts were used before the modern era and how the context of arts and crafts has changed to fir modern society. I think it's funny how you can buy Auerbach's crafts through her website. She wants it to be fine art and it is, but you can purchase it like any other craft. Ethereal template. Powered by Blogger.